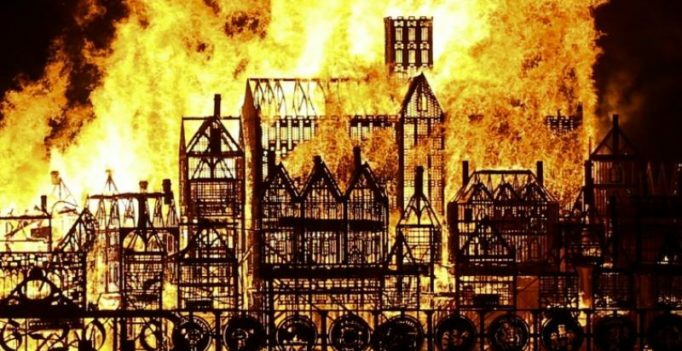 A massive wooden replica of 17th century London was torched Sunday on the River Thames to mark the 350th anniversary of the Great Fire of London, which paved the way for the building of the modern city. Onlookers crowded along the river that winds through the British capital to watch as the 120-metre (394-foot) long wooden model was set alight. Spectators snapped photographs on their smartphones as the flames devoured the replica buildings floating on the water. The torching of the model of London — as it stood on September 2, 1666 — was executed by US “burn artist” David Best and live streamed online. The Great Fire started in Thomas Farrinor’s bakery on Pudding Lane and raged until September 5, destroying 80 percent of the mostly wooden, walled inner city. An estimated 70,000 of the 80,000 residents were rendered homeless by the disaster. By the time the fire was extinguished a total of 13,200 houses, 87 parish churches and Saint Paul’s Cathedral had been destroyed. The London of today, with its characteristic English Baroque architecture in grey Portland stone, was built from the ashes of the wooden city, though the old street layout was retained to respect property rights. Recreating the fire on Sunday was part of a wider series of events to mark the anniversary of the inferno, celebrating the city’s ability to rebuild and thrive. Nick Bodger, head of cultural and visitor development for the City of London, said the capital’s resilience — witnessed again during the 1940s Blitz — helped it rebuild and survive. “350 years ago, when embers from a baker’s oven sparked one of the most catastrophic events the capital has ever witnessed, London’s economic prowess almost came to a fiery end,” he told reporters in the run-up to the anniversary. The London’s Burning programme saw flames being projected onto Saint Paul’s Cathedral — one of the capital’s most iconic monuments which was completed 44 years after the Great Fire.